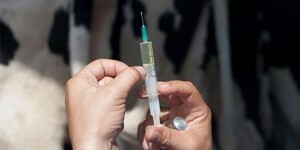 Vaccination strategies should be outlined in the animal health plans. Vaccination, also known as immunisation, is a means to create immunity and prevent disease. Vaccines should be used as a part of a disease prevention programme that also addresses the environmental and management factors on the farm. Deciding on whether or not to vaccinate your animals depends on your farming system and is something that should be outlined in your Animal Health Plan. Vaccines provide protection to some infectious diseases and are achieved by active or passive immunisation. Active immunisation is achieved by an injection containing microbial pathogens that induce immunity but do not cause disease, or with antigenic components from pathogens . The aim of active immunisation is to provide protective immunity and create immunologic memory, then when the animal is exposed to a pathogen subsequently, it will produce a heightened immune response that prevents disease. Passive immunisation involves the transfer of preformed antibodies, such as the transfer of maternal antibodies across the placenta or though colostrum, or from one animal to another. 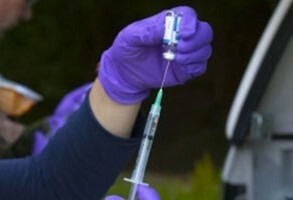 Passive immunisation is usually used as an antitoxin to alleviate conditions or provide transient immunity (short-term protection) and is achieved by injecting a recipient animal with preformed antibodies It is usually given in the case of spider or snake bites where the preformed antibodies ameliorate the toxin from the venomous bite. These are vaccine that contains organisms that have been weakened so they lose their pathogenicity , but retain their ability to provoke an immune response. Attenuated vaccines generally require one dose as they induce long-lasting immunity. Pathogens can be inactivated by heat, chemicals or irradiation so that they are no longer able to replicate inside the host. These vaccines often require boosters to maintain immunity but are easier to produce than live-attenuated vaccines. Some vaccines are made up of either monoclonal antibodies or protein molecules that have been extracted from pathogens or the exotoxins they produce, but few of these are used in farm animal health. To find out more visit the National Office of Animal Health (NOAH) Vaccination of Farm Animals page.